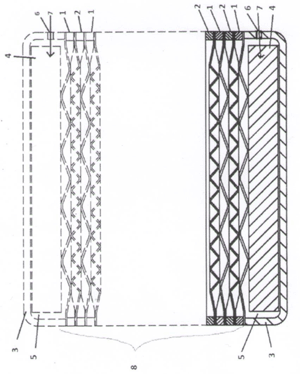 A structure for the end of pressure vessels, most applicably plate heat exchangers, for reducing the effects of movement changes and vibrations caused by variations in internal pressure and temperature. The end is made up of a heat transfer plate and an end part in such a way that the end part is connected by welding to the shell of the outer surface of the heat exchanger stack, forming an enclosed chamber on the end of the heat exchanger, into which chamber higher pressure than the external pressure level is brought and/or generated. The higher pressure receives and dampens, via a heat transfer plate, vibration and pressure shocks harmful to the heat exchanger structure in the medium circuits of the heat exchanger.